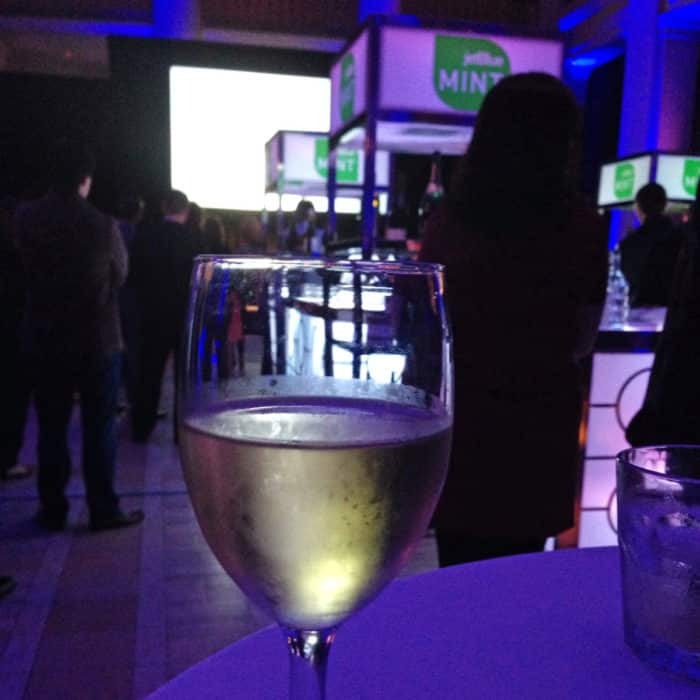 Since Amy and I are fairly frequent JetBlue travelers (and she’s earned Mosaic status), we got invited to a Mint Launch Event in San Francisco. 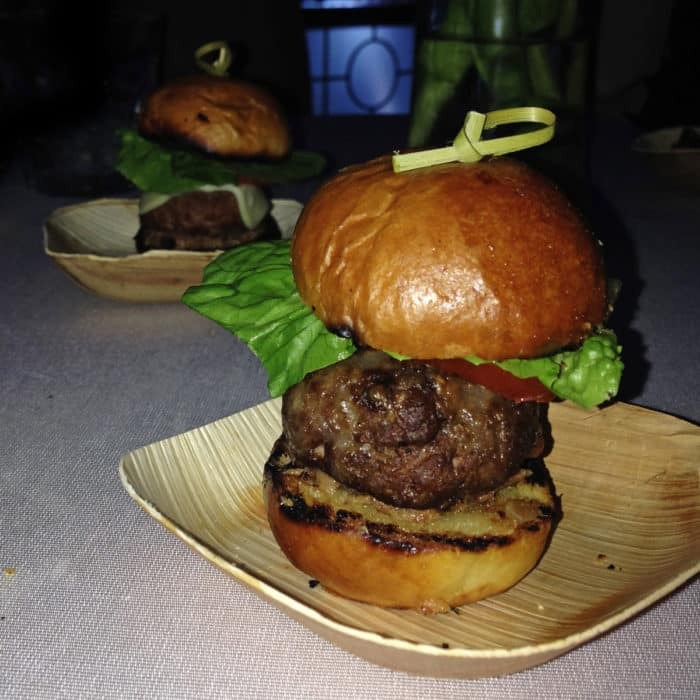 At this event, we had the opportunity to sample the carefully curated menu of food and wine that will actually be offered in-flight, as well as try the the brand new premium cabin seats. Now, I must apologize in advance that this post doesn’t have my usual Nikon 1 photos. I honestly didn’t expect to be as impressed with Mint’s offerings as I was. So I didn’t plan to write about my experience and this post is full of smartphone photos instead what you’re used to finding here. 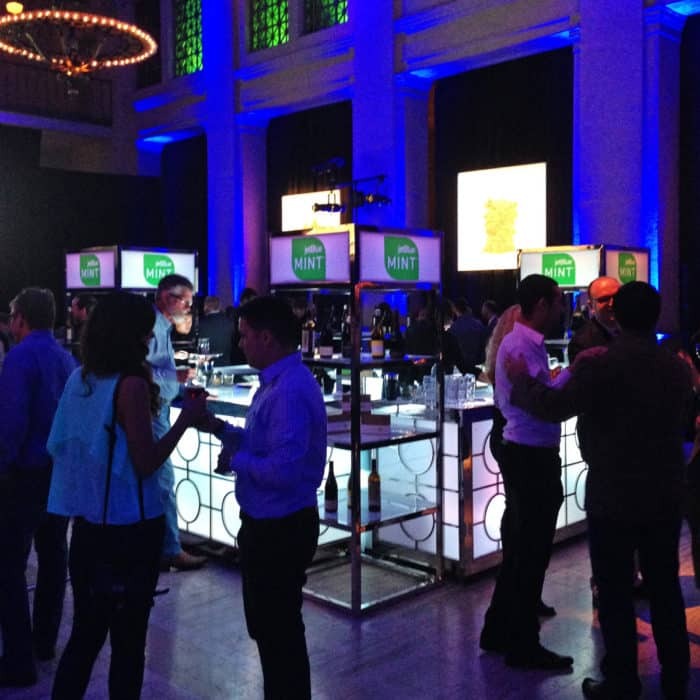 As soon as we arrived at the launch event, our first move was to head to the bar to sample the wine selection. JetBlue apparently brought Jon Bonne, the esteemed wine editor at The San Francisco Chronicle and author of the award-winning book The New California Wine, on board to curate the in-flight wine options and I’ve gotta say, I was really impressed. He spoke to the room and explained that all of the wines are not your ordinary big-name mass produced usual suspects, but are instead carefully hand-picked “little guys” from the each of the various Californian wine regions. He explained that these wines were not just good for air-travel, but, in fact, bottles that you would even be excited to find and purchase with your meal in a nice restaurant. I can’t argue with that logic – his picks were excellent. The Chardonnay from Birichino called Malvasia Bianca was outstanding and would be a wonderful pick to drink in the air. Additionally, they were offering the Juvenile Zin from Turley which is a wine I already know and love from my exploration in Paso Robles. Finally, we tried a Pinot Noir by Copain called Tous Ensemble that I thought was pretty peculiar in that it tasted sort of sparkling. It’s not something I’d ordinarily drink, but I can definitely imagine enjoying that quality while at 35,000 feet. Then it was time to check out those revolutionary (for the US) lie-flat seats. Many would argue that this is the most important and most exciting part about JetBlue’s new Mint offerings. 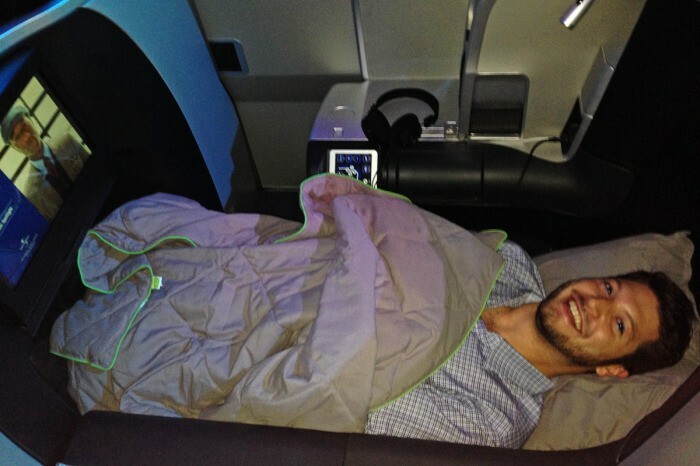 Apparently, they’re so spacious that even someone up to 6′ 8″ could use it in full recline. Right there in the middle of the event hall, they had a setup with three actual Mint seats to try out. They had a couple of flight attendants (or stewardesses or flight crew… I don’t know what they’re calling them these days) there to show us around the suite so I climbed into one of the cabins and sat down to get a feel for the whole thing. I really liked what I found. The individual suite was quite spacious and comfortable with a particularly wide 22.3″ seat and plenty of storage space for shoes and in-flight entertainment. It also featured two power outlets and powered USB ports along with a 15-inch flatscreen with DirectTV. It had plenty of leg room that extended deep underneath the seats in front, and most importantly it reclined to become a fully flat bed. 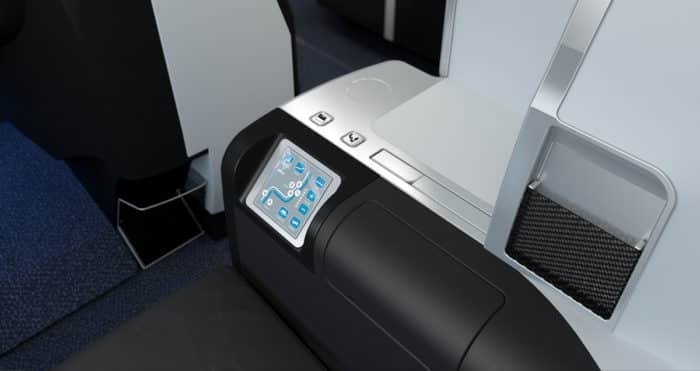 There’s a control panel right next to you for full customization of seat position and firmness and there’s even a massage mode that gently rocks, pulses, and undulates you to complete relaxation. I could definitely see myself appreciating this kind of luxury and comfort on one of my many frequent cross-country flights. And yes, I actually put it into bed mode and had a flight attendant tuck me into a blanket right in the middle of this busy event hall. And now my favorite part, the food. At the event, there were servers wandering around handing out samples of some of the dishes that would actually be offered in-flight. I sort of dove in to the food before getting any real information about it, but I learned soon after that the menu was inspired by the upscale NYC restaurant Saxon + Parole. As a seasoned New York eater, this seemed like a really strange choice to me as I used to live only a few blocks from the restaurant’s Bowery location, but had completely written it off as a place not to bother going to. After sampling this food, I think it’s safe to say that I was completely wrong about Saxon + Parole and its offerings. I just might have to stop in for a meal next time I’m in town! 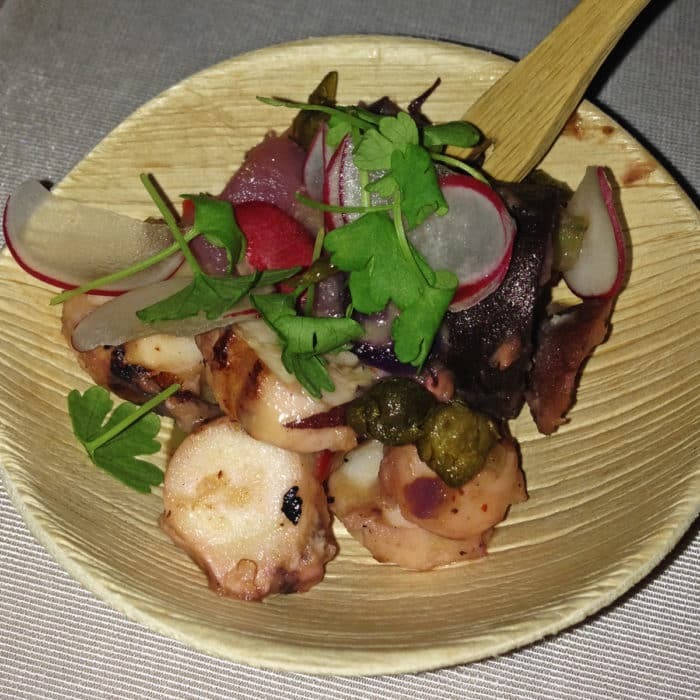 The first thing to arrive was a Spanish-style Braised Octopus dish. No way! They’re gonna serve octopus on an airplane? Count me in. The tentacle slices had a perfectly tender texture and a bold flavor profile from the thick, chunky pimento sauce and a punch of salt from the briny capers. So outstanding – I ate three bowls of the stuff. 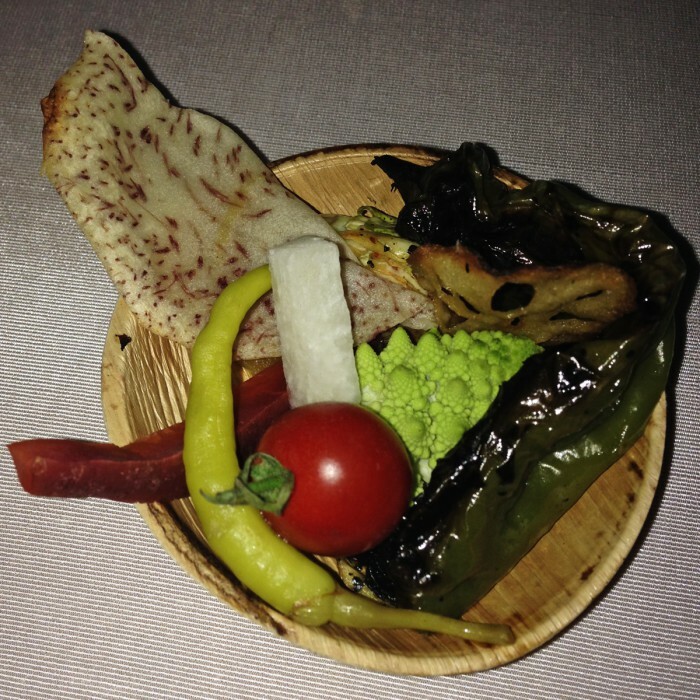 Next up were the Crudités, which were nice, but I’m not a big crudités-guy because, well, it’s really just vegetables. Sure, these were fancy vegetables and they were quite good, but they were simply just vegetables nonetheless. If that’s what you’re looking for, I’m sure it will hit the spot for you. Then we had the Sliders which were stacked mile-high and had a patty that miraculously maintained a pink interior despite its miniaturized size. Honestly it was the thickest patty I’ve ever seen on a slider which solved the main problem I have with the shrunken burger format. It was both seasoned and cooked very well, especially for a mini burger. 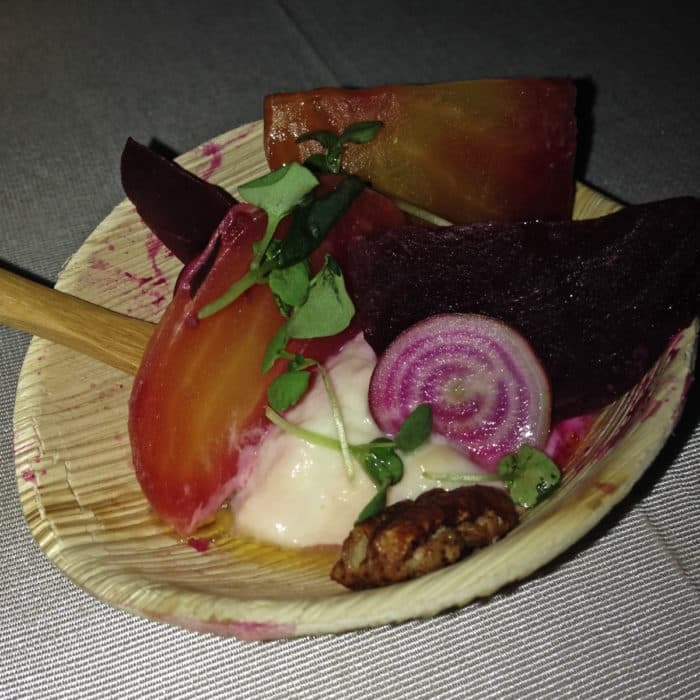 Then came the Burrata with Beets which was just as beautiful as it was delicious. The creamy, milky mozzarella curds were unsurprisingly awesome and the bright, fresh veggie slices and crunchy nuts added a wonderfully vivid contrasting flavor and texture to the otherwise silky and cheesy dish. This was another winner. 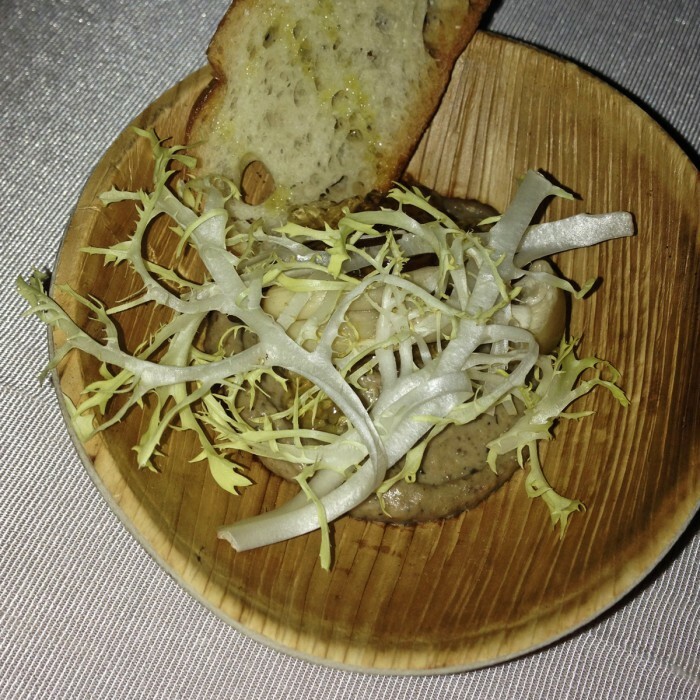 And then came the Truffled Portobello Mushroom Mousse with Parole Whiskey Jelly – my absolute favorite dish that we sampled that evening. This was not just airplane good, this was GOOD good. The silky, creamy texture was spot on and those explosive umami-rich flavors were just outstanding. To top the mousse off, they included a dollop of a jiggly yellow substance called whiskey jelly along with a few mushrooms and frisee. Even my girlfriend who ordinarily doesn’t eat mushrooms couldn’t get enough of this one because – come on – whiskey jelly. At that point, we had run the gamut of savory samplings, but there were some delicious sweets offered as well from a NY Chinatown bakery I had never heard of before called Mah-Ze-Dahr Bakery that they excitedly claimed was a Tom Colicchio find. Once again, some very impressive stuff. The Dark Chocolate Brownie was fudgy, the Shortbread was solid, but – my god – that 7-layer type creation called a Mah-Ze-Dahr Bar was absolutely incredible. 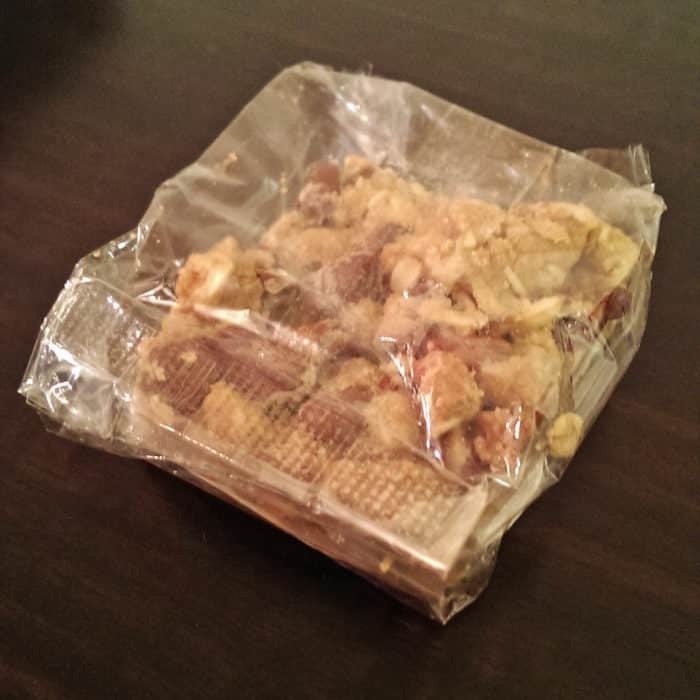 Even the prepackaged to-go versions that you’re likely to find in-flight were moist and delicious. Nicely done, JetBlue! 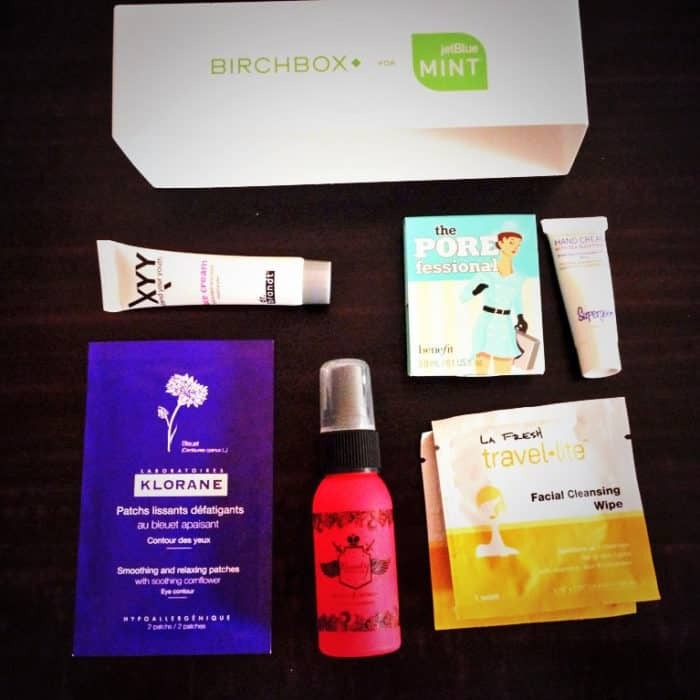 And if that’s not enough to convince you of the merits of JetBlue Mint, they’ll even send you on your way with a customized-for-air-travel Birchbox at the conclusion of every flight. 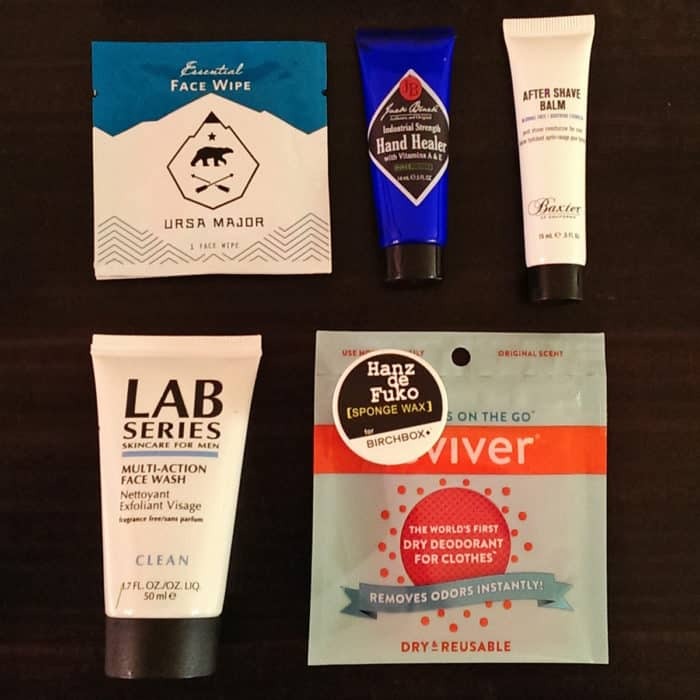 The packages we received (which come in male and female version) included a variety of travel-sized beauty, grooming, and lifestyle products like facial cleanser and hand healing cream to keep us looking fresh once we reach our ultimate (hypothetical) destination. All in all, I’ve got to say I was very impressed with what JetBlue is putting forth with their new Mint service. The quality of the in-flight food and wine is down-right inspiring and the extra space and comfort provided by those enormous cabin suites would be flat-out luxurious for a cross-country flight. I think they’ve done a great job selecting up-and-coming little guy start-up style partners like Birchbox, Mah-Ze-Dahr Bakery, Saxon + Parole, Grado, and all of the local Californian wineries that align so well with the JetBlue brand aesthetic. I’m looking forward to flying in style with Mint very soon.